It is the Wordless Wednesday and we’re joining in with the DogPaws Blog Hop. I’ve pulled out these two photos of my dog for today’s Wordless Wednesday. Misha is allowed on this bed, but she’s supposed to be, you know, the bed. 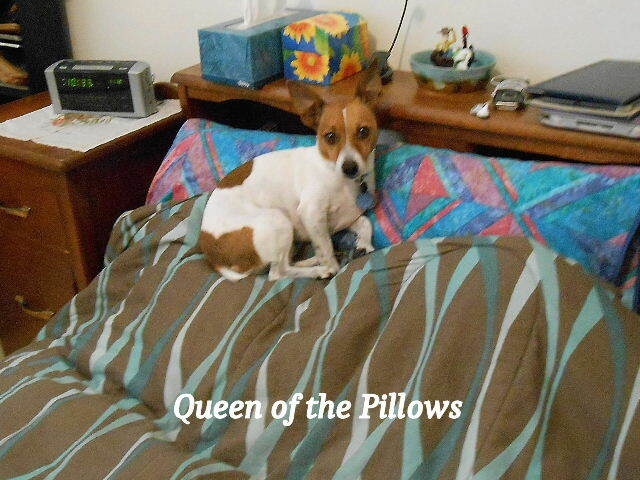 One day I walked in and there she was sitting on top of the pillow. What do you think my dog’s look is saying? My puppy Bailey is obsessed with pillow too. I find her in the exact place as your Misha. At first it was a little “gross” thinking about her sitting on top of my pillow, but I’m actually getting used to it now. Sharon, Thanks for you comments! 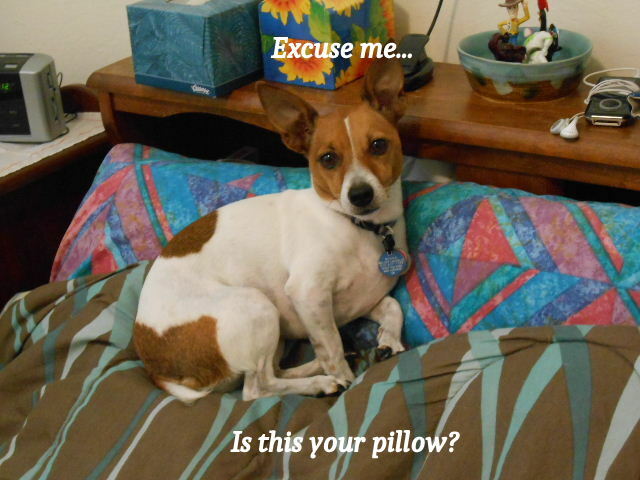 Yes, it can be a little gross to have them up on your pillows. I keep the blankets pulled up over so at least if there is an accident I can clean it up easier. Is Bailey a small dog? It seems small dogs like to be perched up high. Chelsea, I see that Misha isn’t the only dog that likes to be on the human pillows. It’s almost difficult to scold them because they looks so funny up on top of them. Thanks for stopping by! Chewy, That must be true! Though you’d think with two beds and a special tent, Misha would be happy. Grass is always greener up on top of the bed pillos. 😀 Thanks for you comment!